I'll just preface this by saying we don't eat much chicken in our home. Ever since raising our own hens for the eggs, chicken just doesn't appeal to me as a food anymore. But my husband is still a big fan. His favorite is beer can chicken, but I had to draw the line there. Opening the oven to see a whole chicken roasting, perched on top of a beer can, was just too much for me to handle. But in the interest of maintaining marital bliss, I agreed to compromise and do occasionally make a chicken dish. My one stipulation however is that the meal has to be worthy of that chicken giving up its life, in order for us to eat it. This Chicken Piccata recipe fits the bill and has become my go-to, easy-to-cook weeknight way to prepare chicken. It's adapted from a recipe originally created by Giada DeLaurentiis, one of my favorite Food Network chefs. I make it a point to keep capers on hand and frozen lemon halves in the freezer (they defrost and juice wonderfully), so I can make this on a moment's notice. Mix flour, salt and pepper in a shallow bowl and dredge chicken. Reserve 1 Tablespoon of the flour mixture and set aside. Discard the rest. Melt the 4 Tablespoons of butter and olive oil in a large saucepan over medium high heat. When the pan starts to sizzle, add the chicken and cook about 5 minutes or until browned. Turn cutlets and cook the other side until cooked through. Transfer chicken to a plate and keep warm. Add the lemon juice, water and capers to the pan and deglaze with a wooden spoon, scraping up the browned bits and incorporating them. Sprinkle the reserved flour mixture into the pan, along with the remaining 2 Tablespoons butter and whisk the sauce for a minute or two until it thickens slightly. Plate the chicken and pour some sauce over the top. I like to serve this dish with a side of rice so every last bit of sauce can be enjoyed. It's certainly an indulgent meal, but worth every calorie, and definitely one any chicken would be proud to be part of. 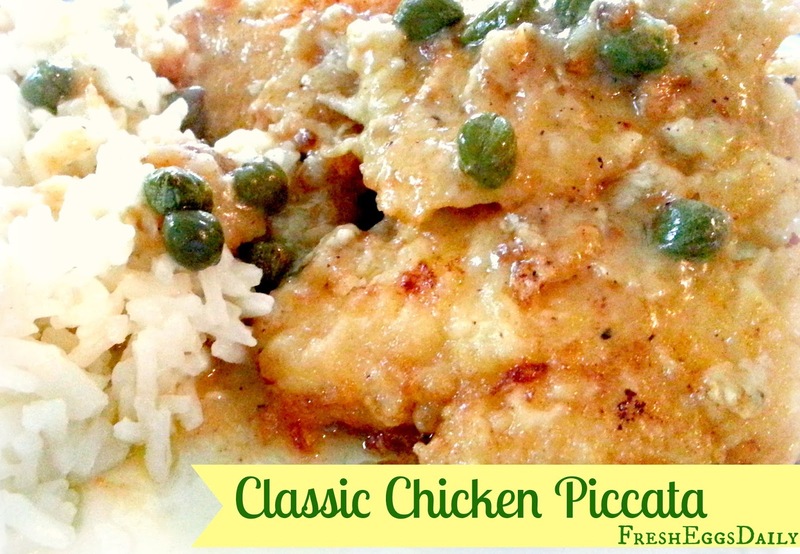 You can't beat a good classic chicken piccata recipe for the perfect pop of flavor. Melt the 4 Tablespoons of the butter (saving 2T for later) and the olive oil in a large saucepan over medium high heat. When the pan starts to sizzle, add the chicken and cook about 5 minutes or until browned. Turn cutlets and cook the other side until cooked through. Transfer chicken to a plate and keep warm. Yummy! This looks Delicious! I will have to try it very soon. Thanks! I buy lemons on sale and wash them then slice some in half to use for recipes like this, slice some for garnish and segment some to use in drinks. Then I freeze them in freezer bags. The frozen wedges make nice drink 'icecubes'. Chicken picatta is one of my very favorite meals. It's fabulous with a glass of chilled white wine, too! I agree, a nice glass of Chardonnay rounds out the meal. I think some recipes call for wine in the sauce but I don't use it - all the more to drink then ! This looks fantastic! And I always fillet chicken breasts for any dish I’m using them in. They cook faster so they don’t dry out. Makes a huge difference. I’m always amazed, too, that a few simple ingredients can be morphed into a fabulous meal.